At the end of each Everest season, operators and officials review the results. They look mostly at the number of summits, deaths, and the issue of congestion at the bottlenecks. There were over 600 summits this year and Everest took nine lives in 2013, ten in 2012. For 2013, this process has begun with gusto as recent articles discussed doubling the permit fees as a way to address crowds and installing a ladder on the Hillary Step to address congestion. I think both proposals are bad ideas. By the way, Nepali Min Bahadur Sherchan, 81, has abandoned his summit climb and is already back in Kathmandu. He held the male age record at 76 but lost it to Japanese Yuichiro Miura who summited last week at the age of 80. Sherchan had trouble getting funds for his expedition and left EBC days after almost every other teams had completed their expeditions due funding and sponsorship from the Nepal government arriving late. Mountain conditions had already begun to deteriorate. It appears Everest 2013 is now over. The Hillary Step at 28,750 feet is a short section of moderate rock climbing. It is the last obstacle before reaching the summit. The Step itself is about 40 feet high at an angle of 45 to 60 degrees. For all climbing Sherpas and most climbers, it is a simple obstacle easily climbed using the ropes installed. In 2013, a second route was installed bypassing the Step entirely for climbers descending from the summit. From what I can tell it was not used by many people as it was hard to find on the descent and required a steeper rappel down than the normal route. Also, in 2013, the congestion was not so severe that people felt compelled to find an alternative. Waits of 15 to 30 minutes were reported by some climbers but most people never mentioned waiting at all. On the ascent, most people will use their jumar to pull their way up the rope, others will more elegantly use footwork to climb slowly using the rope only for protection from a fall. On the decent, the vast majority of climbers with use an “arm-wrap’ technique where they wrap the rope around one arm to provide support as they slowly drop down the rocks. Some back down, other will go face first. Occasionally a person will use a belay device for maximum protection but taking significantly more time. The actually movement is not difficult. What makes it difficult is fatigue, the altitude and having your vision obscured by goggles and wearing an oxygen mask. The suggestion is to put a ladder on the Hillary Step to only aid climbers descending, but it is entirely unclear how that would ever be managed. I do not support a ladder on the Hillary Step in any form. Climbing at the Hillary Step is fundamental and climbers should have this level of basic rock climbing skills before coming to Everest. If a climber is going too slow or having extreme difficulty on the Step, then they may be in danger of a tragic event on the descent from the summit and should turn around to save their own life or avoid a rescue that would put others at risk. I believe having the ladder would undermine the overall difficulty of Everest and encourage those who lack the fundamental skills to take the risk supported by greedy operators. There are better ways of potentially making Everest safer without making it easier. There is a ladder on the North side at the Second Step at 28,248 feet installed by the Chinese in 1975. That section, about 120 feet high with near vertical sections, is completely different from the Hillary Step. It is significantly more difficult and requires expert skills to climb. Without the ladder, almost no summits would occur on that side. Before the ladder, a Chinese climber in 1960 climbed the Step in his bare feet. As the story goes he took off his boots to stand on the shoulders of a teammate to gain access to climbable rock. Conrad Anker, a world-class alpinist, free climbed the Second Step in 2007 after removing the ladders. This was in an attempt to recreate the Mallory and Irvine experience of 1924. Anker rated the Second Step at a 5.10 grade. 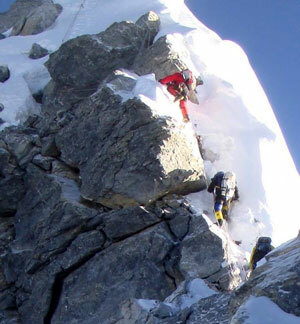 The Hillary Step is often classified as class 4. But again, it is altitude that makes Everest hard in the first place. The second proposal begin floated is to double the permit fees on the South. The concept is to reduce the number of people using affordability. Again, I think this is a poor idea. For most people who climb Everest, money is not their top concern; it usually is time away from work. If they have the ability to pay $40,000 to even $75,000, another $10,000 will not stop most people but further encourage ‘people with means’ to climb Everest for bragging rights further distancing Everest from any kind of spirit of mountaineering. Most likely the increase will have two consequences. The first would be to shift climbers to the Chinese side which is already less expensive due to permit fees charged by the CTMA. The second would be to encourage more short cuts by budget operators to keep member prices as low as possible. Operators potentially would cut salaries, reduce qualified Sherpa support, use more basic food, eliminate paid weather forecast services, use less expensive group gear. A myriad of cost cutting that could impact safety. 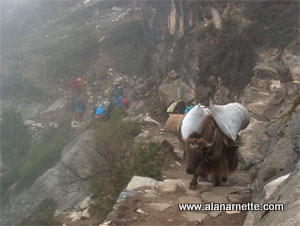 In 2013, I was told by one reputable guide that a local Nepalese guide service charged members USD$18,000. One way to do this was that they allegedly paid their Sherpas USD$700 for the entire season, a wage much lower than what is mandated by the Ministry of Tourism. Most Sherpas are paid thousands of dollars depending on their role. First, what is the problem on Everest that attracts attention? Usually it is the reports of deaths. Then there are reports of long lines. Clearly both are problems but safety is at the root of the arguments. I believe the basis of these issues lie with inexperienced climbers that are enable by poor operators and guides. The inexperience shows up in slow climbing, ignoring health issues and taking unnecessary risks to achieve the summit. For Everest both of these options would require cooperation on both sides to achieve the goal of increasing saftey and prevent switching to the side with the looser permit process. Alan, I disagree entirely with your attitude. Sagarmatra is sacred religious place first of all. During last hundred years religion had been slowly substituted by sport all over the world (approximately started from national- som ideology). Let return Sagarmatra to its proper place. It should be available to everyone. Today the offers look ridiculous. Using presently known and well developed technologies of space stations one may raise the chain of hotels with isolated internal micro climate instead the existent tourist camps. It may be joint venture of westerns and Nepali hi-tech companies which in addition will push region economic and education level further up (and Sherpa in particular). Well said as usual Alan. I have yet to read a more all round comprehensive, well reasoned and well expressed article. Your experience shines in this post. Your perspective is well said. I’d say remove all fixed lines and ladders, stop dumbing down the mountain to suit our (human) infantile needs. You can’t make Everest safer so stop trying. Only thing to do is to try and make the climber smarter, a far reach at that but worth a try. Why this urge to make things better? Money duh… Are we really surprised people die? While not a climber at all, I have enjoyed all of the information that has been conveyed. I can honestly say that reading all the news and blogs leading up to all of the summit climbs, and how well it seems to have gone, has been exciting. As the season ended, I was disappointed that it was over, and I am sure that all the climbers were as well, but were greeting ready for the next one. Take care, all. It was fun. I think Graeme’s suggestion is also a good one. Bit of a selective application there Sean. Surely if you advocate no ladders on the mountain, that should be the whole mountain? As Sherpa deaths always make up a high number of fatalities each year, employing companies should make it mandatory that all Sherpa’s, load carriers and members clip in at all times and failure to do so means instant dismissal. To help with this it’s probably something that could benefit from a little technogical advancement making the whole process more efficient and easier. Hey Alan. I kinda think along the same lines. I think the permit fee should be substantially increased but climbers can get points or a fee reduction if they have climbed other mountains in Nepal. So for example the permit fee increased to 20k but reduced by 5k if the person has climbed AD, 10k if climbed Manaslu, 2k if Island Peak and so on. Further incentives if climbing outside the Khumbu to channel climbers to more impoverished regions. I know it’s a pipe dream but yes there could be a lot smarter ways to reduce congestion but still provide the revenue and employment for Nepalis. Alan – I like your idea of providing a discount on the permit fee for folks that have done another 8000er to encourage folks to learn skills on a safer mountain. That of course presumes that there are safer 8000er mountains which some recent avalanches might contest! Typically the most common prep climb is Cho-Oyu, which is what I used in 2008 as prep for my Everest climb in 2009. Unfortunately for the Nepal government, the climbing route on Cho-Oyu is via Tibet so there would be no incentive to provide a discount. They could however raise all rates and hold prior 8000er summiter’s to the current rate. That would increase revenue and perhaps safety. A few other changes could be made to increase safety and are recommendations I’ve made to friends climbing the mountain. 1) Carry high altitude medications (dexamethasone, nifidepene, etc.) for yourself and to treat others and become trained in their administration. I carried these and with my teammate and two members of the Coration women’s team helped administer Dex to an Irish climber in 2009 that had gone unconscious below the summit. He revived and survived. 2) Carry a radio to communicate with your own team and others on the mountain. Know other team’s frequencies. 3) Carry a GPS – program in each camp so that even if fixed lines get buried in the snow, you can find your way to camp and not get lost in a white out. You can also radio your position to others. 4) Watch the time, your oxygen levels, the weather, and your energy! You need to learn this on your own and a prep climb elsewhere would help folks do that. I totally agree with you on both counts Alan. I am truly amazed that in 2013,with the info available online via good reputable blogs like yourself,people still don’t research the right operator to go with! Thanks to the info I gleaned from your blogs,I contacted IMG & AC, and both companies made it very clear that I would need to show competence by climbing the likes of Denali,Aconcagua,and Cho Oyu,before I’d be considered! I eventually decided to go with Tim Mosedale simply because he is in the UK, I can stay with him from the start of my training to the end when he thinks I am ready to attempt Everest! But when you read his requirements, you know that safety and training are paramount! And that is what it boils down to. Each climber is responsible like a road user to ensure they are qualified not just for their own safety but the safety of others! Climb On!! My 2 paisa: with 12km fixed lines running from BC up to the summit turning Everest each year into the world’s most extreme temporary “via ferrata” a tiny ladder of some meters length will change the mountain’s character only insignificantly – why should this make much difference compared to the decades-old northern counterpart? But there’s a much more relevant trend going on: People don’t consider it any longer necessary to complete their descent to boast their “firsts” or “records”. First “record climber” Sudarsham Gautam got into trouble while returning to South Col, so his sherpas took him to roughly 7800m, where he was picked up by helicopter, this fact ironically granting Simone Moro the opportunity to achieve a real record by conducting the highest longline rescue so far, topping his former retrieval of a Korean climber from 7000m some days before. And, even more unpleasant (because this wasn’t certainly a case of emergency, as with S. Gautam), next “record climber” Miura Yiuchiro quietly slipped from Camp 2 (via heli, of course), citing a “major collapse in the icefall” (which wasn’t albeit registered by other climbers) – but maybe he was only in a hurry to get to his Kathmandu press conference in time to inform the world of his heroic deed. I’m curious how such “incomplete” summits (at least in my humble opinion) will be listed in Miss Hawley’s database. But I guess, with this development, we may see the numbers of ailing climbers’ casualties drop somehow (as people soon will be rescued from heights up to South Col on a regular basis), while helicopter crashes (as the one 2010 on Ama Dablam) will happen more often. Plus, Everest will attract even more unexperienced and ambitious members as the conception of easily being picked up in case of an emergency will get even more widespread through press reports. How false this belief can turn out just has been proven by the extremely distressing fate of unfortunate Juanjo Garra on Dhaulagiri. Good post, Alan. For an Everest climb to remain true Alpinism one needs to minimize anything that comes between you and the mountain. Ladders outside of the icefall should remain prohibited. Money makes decisions, whether good or bad, and will always be the deciding factor no matter what the activity might be. If someone has the means to pay any amount requested, rules will be ignored, lines will be crossed, and all the safety measures will be meaningless. Great article, Alan Arnette, you hit the nail on the head. Difficult situation. Ladders and increasing fee are really bad ideas, but each guide company should make sure that the climbers have the experience climbing other big peaks that are 8000 m and above ! Everest is not the place to learn how to climb ! !! We should just install escalators…then everyone could go! very good reasoning Alan. the sense of achievement can’t be as great knowing you got to the top through using a ladder at the Hillary Step. What about making people qualify . ie need to have climbed other rated peaks. It would have a good spin on the whole climbing industry by creating more activity for guides through out the year in all countries. Excellent point as usual Alan! Also agree, both are bad ideas. Ladders on any mountain make be a bit sad. I wouldn’t mind seeing prerequisites to climb Everest, but would in some ways prefer that they not be exclusively Himalayan peaks.